The all-new design technique with this Emboss Gel will make your work easy and effortless! Create 3D elements and basreliefs and accompany them with Aeropuffing technique, applying colored Gel Paste on top of the embossed elements with your Puffing Sponge. Use Emboss Gel in combination with Aeropuffing Gel Paste to create copper, golden and silver relief vintage nail art, or to achieve patina effect. Emboss Gel is also a great aid in creating convexed linear designs. 36 Watt LED Light = 60 sec. 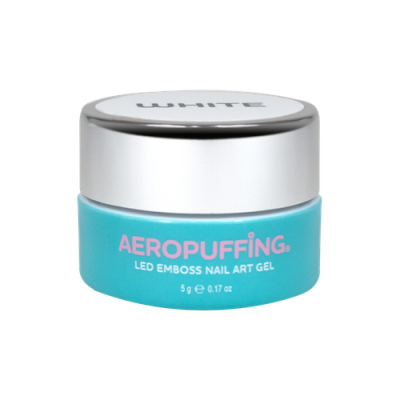 Emboss Gel does not have a tacky residue after curing and you can apply Aeropuffing Gel Paste with the Puffing Sponge right away onto the embossed surface of the nail. Cap the nails with Aeropuffing No Cleanse Matte LED Gel Top Coat and cure. Apply Emboss Gel over the cured surface of the top coat. In the same way the Emboss Gel can be applied over the surface of the nail that has the cured Aeropuffing Gel Paste color on it.